Drake is going to co-host The Rap Show on Radio 1 and 1Xtra this weekend. Tiffany Calver, who took over the show from Charlie Sloth in January, is currently opening for the Canadian megastar on his European Assassination Vacation tour. His run of seven gigs at the O2 in London comes to an end on Thursday. 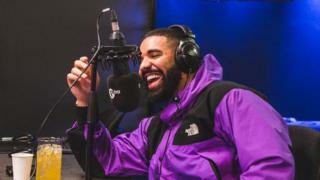 Drake will co-host The 1Xtra Rap Show with Tiffany Calver on Saturday 13 April from 9pm. You can listen on Radio 1 and 1Xtra. "We'll talk about tour, we'll play some games, we'll play some music - it's going to be a vibe," Tiffany said when making the announcement on the 1Xtra Breakfast Show. According to Tiffany, Drake's appearance on The Rap Show was all his idea. And for a taste of what's to come, she revealed that touring with Drake is like "touring with your nan", when speaking to Greg James on Radio 1 Breakfast. "There's nobody else on the planet you'd probably want to tour with. "Me and Nick Grimshaw were talking about it the other day, it's like all these fancy candles and pinot grigio. It's like touring with your nan. It's great."